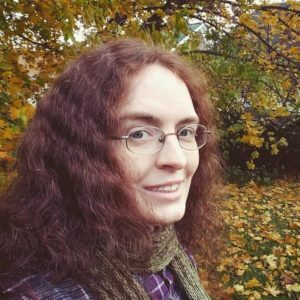 Her past professional work includes homegoods product design, tabletop RPG art, card game artwork, editorial illustration, hand-drawn and lettered logos. Between commissions she is currently working on personal storytelling projects and expanding her portfolio to invite work in kidlit. You can find links to current options at shop.emmalazauski.com! To commission custom artwork or inquire after paintings still in progress, email me at emma@inklingart.com. Can I use your artwork for my project? You can commission custom artwork unique to your project, or you can license available existing art. Please email me to discuss the details and get a quote. If you are in a hurry and on a tight deadline please make me aware of your time table! Tattoos are the only use of my art that I do not charge a fee for (although thank-you tips are appreciated through PayPal or Ko-Fi! ), and I would love to see a photo of the finished piece. I do respect your privacy and I will not reshare your personal photos without your direct permission! Tattoo shops may not use or display my work as flash without first arranging for a license, but if a customer is the one who brings the art to you because they saw it outside your business, that tattoo has my blessing. If you would like me to create custom artwork for your tattoo, please email me at emma@inklingart.com to discuss commissioning the design. What materials and programs do you use? I prefer watercolors, gouache, and inks for physical work, though I also occasionally color my work digitally with Clip Studio Paint, Photoshop and other painting programs. For drawings I use felt liner pens (such as Microns), and brushes with ink. For sketching I use mechanical pencils, colored markers, ballpoint pens — basically whatever comes to hand at the time. Sketching in a variety of materials keeps it interesting for me! I grew up in the woods in the middle of nowhere, we had terrible TV reception, no cable, few other people my age around, and parents who shunned video games. Internet access was limited. I liked reading but couldn’t make it to the library very often. Making things and using my imagination was how I entertained myself, and still is! There are so many, but here are a few! My very earliest artistic influence that I remember was a pop-up book edition of Alan Lee and Brian Froud’s wonderful Faeries book. Beyond that I love the work of Guillermo del Toro, Beatrix Potter, John James Audubon, Nico Marlet, John Howe, Peter De’Sève, and many more. Do you have any non-art hobbies? I play games with my friends (tabletop RPGs such as D&D, Eclipse Phase, Pathfinder, and FATE are popular with us). I also enjoy writing, books, learning about almost any subject, reading, movies, hiking, cooking, and tea. This page is a perpetual work in progress. If you can’t find your answer here, email me!